We all love a good story. We’re so addicted to stories, our television brings us hundreds a day. (Even on talk shows, the host wants his guests to tell a story!) Drop in on your local cinema and no matter which screen you’re watching, it’s all stories. And the book publishing business–well, you get the idea. There are a thousand reasons for dropping the occasional story into your sermon, pastor. Here are my top three…. 1) It makes the hard truth tastier, a little more palatable. No one knew this better than President Abraham Lincoln. The great story-teller received many an irate and demanding politician in his office, upset because he had fired this general or backed that program or would not hire a constituent. Lincoln welcomed them, schmoozed them a little, and told them a story. A half-hour later, they walked out without getting what they came for, but satisfied with what they were given: a story with a message to think about. You’re preaching on racism to a collection of prejudiced, narrow-minded churchgoers who do not want people of “that” race, whatever it happens to be, since racism comes in all colors. How to do that and get out of town alive? You decide to tell them a story. The points of your story can sneak up on them and do its good work before they realize what hit them. When the Prophet Nathan was assigned to confront King David with the bitter facts of his adultery and his subsequent manslaughter to cover it up, he chose to tell a story. In doing so, he carried the day and left us a lesson never to be forgotten. 2) It makes the truth clearer, easier to understand. The keepers of orthodoxy in Judea–that is, the scribes and Pharisees–were upset that Jesus, a rabbi of note, seemed to be hanging out with the lowlifes of the community. “This man receives sinners and eats with them,” they said, implying that He was no better than scum Himself. In answering His critics, the Lord told three stories, about a lost sheep, a lost coin, and a lost boy. The last one, the tale we call ‘The Prodigal Son” carried the day, I expect. It totes a wallop neither of the others did. 3) It makes the truth unforgettable. Old man Sykes, who ran a general store back home, had a yellow dog which he thought a lot of. However, in the village there were several small boys running loose who loved to pick on that dog. One day, the boys slipped “a cartridge with a long fuse” in the meat they fed to the dog. Then, they lit the fuse and ran. The dog was blown in every direction, of course. Lincoln told General Grant that before he got to the end of the story, his visitors were looking for their hats. “And, I was never bothered any more after that” (by that group). 1) It must be appropriate and fit the situation. Try telling it to your wife and child, pastor. Their reaction will tell you all you need to know. 2) Do not load your sermon with too many stories. The more you tell, the more you diminish their value. Two good stories per sermon are ideal. 3) You need some kind of file in which to keep the stories you come across. No one can remember them all. I expect we’ve all had the experience of coming across an old sermon of ours and discovering a great story, one we had forgotten and wished we had used more over the years since. 4) Work at learning to tell a story well. We don’t need to know that you read this in a book somewhere or it was told to you by a friend (unless that is pertinent to the tale). If someone asks your source later, you can tell where you got it. I’d like to end this with a story, then make a comment or two about it…. A wealthy rancher ran an advertisement in a newspaper: “A bonus of $50,000 will be given to anyone who can build a fence around my property that is guaranteed never to fall down.” Various ones applied for the job, but none could convince the rancher their fence would never fail. Finally one man pulled it off, got the job, built the fence, and walked away with the big money. I love that little story. I first ran across it in “The Sword of the Lord,” a fundamentalist weekly from maybe forty years ago. 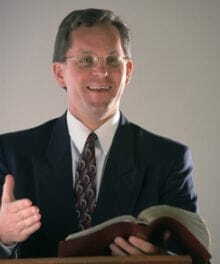 The story-teller was a pastor making a point in his sermon about the “living and abiding” word of God. Every time people have tried to banish or destroy the Holy Bible, it has come back stronger than ever. As a result of the story making its point and capturing my imagination, I never forgot it. And here I am, nearly a half century later, sending it into cyberspace, almost certainly guaranteeing it will show up in more sermons in the future. And how good is that!